How would you like to discover the most amazing and beautiful mysteries of Ancient Egypt in just one lovely evening? Feel the real spirit of the Orient. Listen to the enchanting music of Arabian nights. Let yourself to have such a lovely treat – Alf Leila Wa Leila (1001 Nights) evening show. 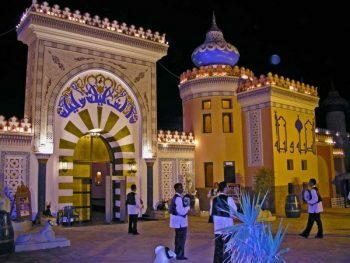 Bring your friends and your family to share this entertaining nights – see the magicians, horse riders, oriental dancers,Fountain show and sound&light show Take an exiting tour through the history of Egypt. Feel yourself a part of this beautiful world full of wonders.